After learning about prosthetic engineering, Los Molinos SERRF students work together to build prototypes of prosthetic devises for a "bionic animal". After the prototypes are complete, they will be entered into the Tehama County District Fair in May 2019. Berrendos SERRF students proudly display their artwork and artistic abilities acquired, through a 6-week art club presented by instructor, Joyce Turley. Up Up and Away! Antelope SERRF students are improving reading and math skills with this fun "Super Hero" Club. Recently, SERRF students from three Tehama County Middle Schools, Maywood, Vista, and Berrendos, worked collaboratively to promote philanthropy in their programs! The students sold 240 lollipops to raise money to purchase supplies for the Barry R. Kirshner Wildlife Sanctuary in Oroville, CA. Several students were selected to personally deliver the supplies to the sanctuary, and were also treated to an amazing tour of the facilities! “We are so grateful for the donations and love what you are teaching your students!” said Mrs. Barry Kirshner. Richfield SERRF students celebrated the Great Kindness Challenge! This is a proactive and positive celebration, devoting the week to perform many acts of kindness. They celebrated in many ways, one way included dress up days! Their favorite dress up day was crazy sock day! Thanksgiving may be over but not the fun. Students from Rancho Tehama SERRF Expanded Learning Program weighed and measured the height and circumference of pumpkins donated by Julia’s Fruit Stand on Hwy 99. While exploring, some students found that’ their’ pumpkins weighed more than ‘they’ did. When challenged to find out if a 6-ounce pumpkin had more seeds than the 58-pound pumpkin, they needed to use a sledgehammer to break the big one, creating laughter and screams of joy. Final steps were harvesting the seeds and carving the pumpkins. Young Marines Trevor Kain and Nicholes Heise, talk with Berrendos SERRF students about the importance of leadership and the options that youth have to step up and make a difference in their communities. Antelope SERRF 1st grade students are enjoying the "Doors To Discovery- Healthy Me" curriculum. Students are learning the difference between a Medical Doctor (MD) and a Doctor of Veterinary Medicine (DVM). Richfield SERRF students have been learning about what it means to be Brave! We all know being brave isn't easy, but we practice bravery almost every day! Students have shown us they have the ability to be brave, and can show this by practicing mindfulness, kindness and respect. Plum Valley SERRF students have been participating in CATCH ( Coordinated Approach To Child Health) Parachute Games and Challenges. They have learned cooperative strategies and team building skills, while having fun being physically active. We are fortunate to have instructors come to SERRF to teach students various extra-curricular skills. Metteer SERRF students enjoyed 6 weeks of American Sign Language Instruction. Juliska Eklund, sign language instructor, taught Metteer 1st, 4th and 5th graders how to sign the alphabet, numbers, and different animals. It is amazing how quickly the students learned how to communicate with their hands and how engaged they were in learning a new skill. Antelope SERRF strikes a pose for the "Lightbulb Challenge Project" on behalf of The Afterschool Alliance. On October 25th, all SERRF sites will celebrate Lights ON! Afterschool, the only national celebration of afterschool programs! Los Molinos SERRF students help the beautification process of our school garden, while learning about how to create a compost pile to reduce waste. Antelope SERRF students participate in a "Contraptions Design Challenge" working through an engineering process utilizing KEVA planks, during ""Fun Friday" activities! Berrendos SERRF students actively engage in "Minute To Win It" games on their first Fun Friday of the school year. Lassen View SERRF Summer program had some very special visitors. George Zimmerman and Bessie Heggie, with their dog Winkie, brought a working bee hive to share. Students were able to find the queen bee, observe honey in the honeycomb, and watch bees dance! Richfield SERRF heads to Oroville Forebay after studying water safety and conservation. Students enjoyed time on the water, learning how to use different types of water equipment: Kayaks, canoes, paddle boards, and paddle boats. Java Lanes host Rancho Tehama S.E.R.R.F. Principal Paula Panfilio, students and families from Rancho Tehama S.E.R.R.F enjoyed a field trip to Java Lanes bowling alley in Corning. Students participated in a six week lesson plan to prepare for the trip. The families that attended appreciated that the S.E.R.R.F program often provides many of these very educational and exciting field trips. Lassen View SERRF students have been hard at work making a raised flower bed and planting the beautiful floral plants donated by The Home Depot in Red Bluff. The primary students have been learning about gardening and plant life cycles. Berrendos SERRF students enjoy playing "Spike Ball" with Sports Instructor Adrian Hernandez. Recreation, including Moderate to Vigorous Activity (MVPA), is a required component for the California Department of Education After School Education and Safety (ASES) Grant, that helps fund SERRF. The 4th-8th grade SERRF students of Reeds Creek School enjoyed a special visit from Michelle Ackley of the Red Bluff High School Temple Grandin Team. Students listened to a presentation based on the book, “Temple Grandin, How The Girl Who Loved Cows Embraced Autism And Changed The World”. Reeds Creek SERRF students had spent 6 weeks learning about the life and accomplishments of Temple Grandin who was diagnosed with autism when she was a child. Dr. Grandin is a professor of animal science, a consultant to the livestock industry on animal behavior, and an autism spokesperson. During the Great Kindness Challenge Week in January,students are challenged to do as many acts of kindness they can in one week. 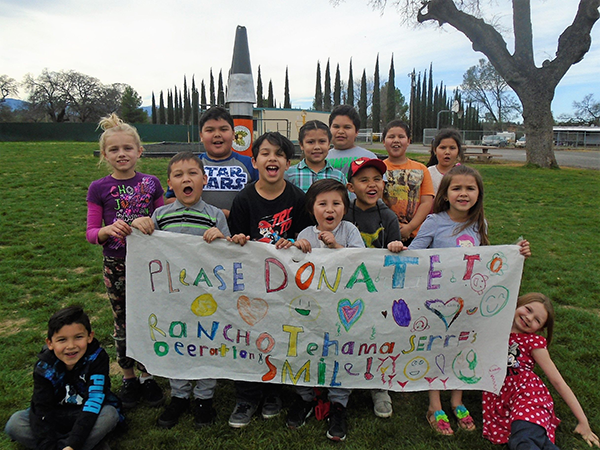 As an “act of kindness”, Rancho Tehama SERRF students, chose to raise money for Operation Smile. Operation Smile is dedicated to changing the future of children with cleft lips/pallets one smile at a time. One in five children born in this country will be affected by this. Fortunately surgeries are easily available for children in this country. However, this is not the same for children in other countries to get these life altering surgeries. These children are often shunned from their communities. With one 45 minute surgery only costing $240.00, their lives are changed from a lifetime of sadness to a life filled with hope. Please help Rancho Tehama SERRF students change the life of a child. Donation centers are located in Red Bluff at House of Design and Dandy Lion Children’s Shop. In Rancho Tehama the two local stores, the Rancho Tehama Association office, and the Rancho Tehama Elementary School office. Deadline to donate is April 30, 2018. Manton SERRF students researched a Hugelkultur garden bed (raised garden bed that doesn't require irrigation or fertilization) and decided it would be a beneficial addition to our garden. The students gathered and layered leaves, grass clippings, twigs, branches, corn stalks, and compost to create it. It will be ready for planting in April! During the week of January 22nd The SERRF Expanded Learning Program celebrated "The Great Kindness Challenge". The 126 students that go to Bidwell SERRF spent the week trying to spread kindness throughout their entire school. Bidwell SERRF students wanted to make sure the lunch room staff felt the kindness. They made some posters to hang around the cafeteria to remind them how thankful they are for what the staff does for them and their classmates. Pictured are: Ms. Brittany, Alex, Carter, Carson, and Neila. Maywood SERRF expressed their thanks and appreciation to the Maywood Staff by creating "thank you" posters during the week-long "Great Kindness Challenge". The SERRF students also created and posted posters challenging all students to perform acts of kindness, creating a culture of compassion on their campus. Los Molinos SERRF students want to give a big shout-out of appreciation to Luigi’s Pizza, in Red Bluff, for donating pizza boxes to our “Unicorn Pizza Parlor”. For 3 weeks, students learned about the math and the science involved in running a pizza parlor. To culminate these lessons, SERRFers opened a pizza parlor on Friday for teachers and support staff at school. Although it was paper pizza, with paper toppings and even a paper oven, it was a “REAL” fun turnout!